Confession time: I have a really hard time with 'self help' sort of books, or books with some message that I am supposed to learn in the process of a story (see also The Shack, The Alchemist). I tend to feel like these books are just common sense in a pretty package and often underestimate the reader. The Book of Joy: Lasting Happiness in a Changing World seemed dangerously close to falling into this camp, but I thought I could use some extra joy, since the world at large is giving me a little anxiety these days and I was looking for a new audiobook. 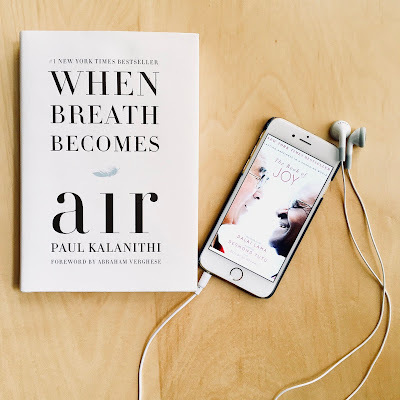 Just before I started listening, I finished reading Paul Kalanithi's book, When Breath Becomes Air , a young neurosurgeon's account (published posthumously) of being diagnosed with cancer. As I was listening, so much of Paul's message seemed to echo in the words of The Dalai Lama and Archbishop Desmond Tutu. What I loved about both books was the crossover of faith and science. Sort of supporting my own personal feeling that the miracles of science, of our biology, is it's own type of spirituality and it informs all the world's religions. It would seem that Kalanithi's decision to become a neurosurgeon had more to do with humanity and exploring the soul than just being a doctor and helping others. Thinking about what makes us who we are, and how amazing the human brain is, was absolutely fascinating and gave me so much food for thought. In this way, I think When Breath Becomes Air made me more open to the teachings of Tutu and the Dalai Lama. They are obviously of different faiths, are welcoming of all religions, and agree that science is intertwined with our spirituality. The ways in which they support the '8 pillars of joy' with such intriguing scientific facts is so compelling. For example, people who have a more self-centered perspective and use mostly personal pronouns ( I/me/mine instead of we/us/ours) run more risk of heart attack, and fatal ones. Apparently it's more of an indicator than smoking, high blood pressure or high cholesterol! Or that holding grudges increases stress, and that even just THINKING about forgiving someone lowers stress levels. So much good stuff. Also, the pair are adorable and entertaining, always joking with each other, and they have the funniest of idiosyncrasies (Tutu loving rum and Coke, and switching to Coke Zero to ingest less sugar made me smile). After listening to The Book of Joy I quite literally went back to see if it was published before Kalanithi's book. It was not, but I wonder if he followed the work of these two great spiritual leaders. Much of the way he dealt with his cancer and diagnosis seemed informed by the pillars of joy, despite suffering. The Dalai Lama and Archbishop Tutu talked often of joy through suffering and one of my favorite passages from When Breath Becomes Air is when Paul and his wife decide to have a child. “Will having a newborn distract from the time we have together?" she asked. "Don't you think saying goodbye to your child will make your death more painful?" 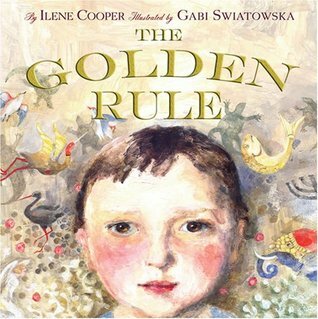 Speaking of kids, I highly recommend a book about the world's religions for very young readers called The Golden Rule . I picked it up one Christmas and it outlines how all religion and spirituality are centered around the same general beliefs, which is reflected in The Book of Joy. If you, too, are a little hesitant about 'woo woo' spiritual type books, I'd still definitely recommend these two (three!) great books that read great together.